In addition to the already described filter, it is possible to switch to structure view. This alternative view enables you to filter solely on the basis of the organisational structure. Although this type of filtering is also possible in standard filter view, you are able to directly see the complete organisational structure in structure view. 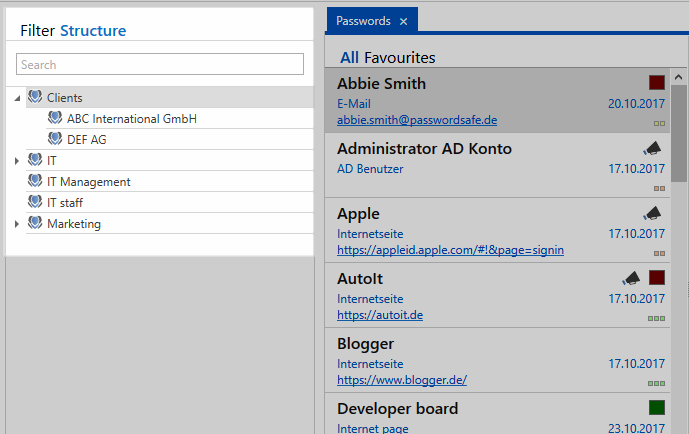 *As there are no longer any folders in Password Safe version 8, the structure view can not mirror all of the functionalities of the folder view in version 7. However, the structure view has been modelled on the folder view to make the changeover from the previous version easier. As you can see, only the organisational structure is visible in this view. This view is the ideal choice for users who want to work in a highly structural-based manner. Display mode: It is possible to define whether the standard filter, structure filter or both are displayed. If the last option is selected, you can switch between both views. Display mode status when starting the program: This setting defines which display mode is displayed as default when starting the program.